3 years after seeding year for viability. 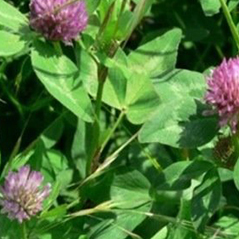 3 year Medium Red Clover offers producers a persistent, winter-hardy variety that works well in hay or pasture mixes. 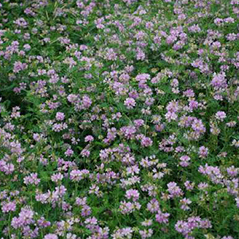 Red Clovers should be inoculated and not exposed to sunlight or planted within 12 hours of inoculating. 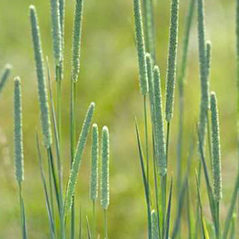 Planting depth should be 1/4″ in a well prepared seedbed or thin stand of grass sod. Red Clovers can be successfully frost seeded if drilled or broadcast on grass sod in January or February to let freezing and thawing work the seed into the soil. Red Clovers can also be no-tilled into small grains or grass sods. When grazing red clovers, turn livestock in when plants are 6-8″ tall. Remove the animals when 3-4″ of the plants remain. Do not graze after September 15th to allow plants to store up reserves in the root system. You can graze again after the first killing frost. 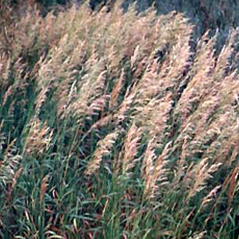 Seed production is dependent largely on insect activity. Plants do not self pollinate. Bumble bees are particularly effective. Normal fertility requirements are about 30#’s of phosphate and 90#’s of potash per year to maintain fertility levels when used for hay. Soil tests should be used as a guide. 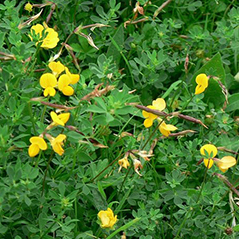 Red clovers are often used in grass mixtures predominantly for cutting. Red clovers are one of the fastest establishing legumes and can even be grown on more acidic soils. The main draw back is limited persistence and winter-hardiness. However, through breeding, improvements have been made on these characteristics.